Ok so I need some help.. I've been growing up my cells and have been noticing some rather odd finger\baseball bat like projections from my cells.. See the images i've attached..
My cell line is an NK like cancer cell line (acute lymphoblast leukemia origin)called YT, there is very little information out there about the morphology of these buggers - I've spent ages looking for photos of the cell line..
Basically I have no idea what the hell they are.. They don't seem to affect the viability of my cells and if left for several weeks, they don't seem to take over the culture either.. So i'm freaking out as I've checked about 8 different frozen batches and all of the cells I thaw seem to have some cells with this odd morphology.. So I've got to the point where I have no idea what to do about these and whether it some type of infection or whether it's just cytoplasmic blebbing gone crazy..
As all of my frozen stocks have these fingery things, I'm not sure if there is contamination and if so is it coming from somewhere in my cell lab or could it be from the lab where I originally got the cells from (obviously I don't want to ring them and ask them if they gave me dodgy cells.. or is it that my cells are just weird?? HELPPP MEEEE!!! I'm on the verge of losing the plot with this little problem! Does not look like any contamination that I have ever seen in 33 years of cell culture. Hoescht staining will only show up Mycoplasma contamination IF it is a massive contamination. Question: Have you Mycoplamsa tested the cells?? ?.......by Agar Growth Assay????? Question: Have you changed the batch of FCS recently?? ?....this can sometime account for morphology changes. 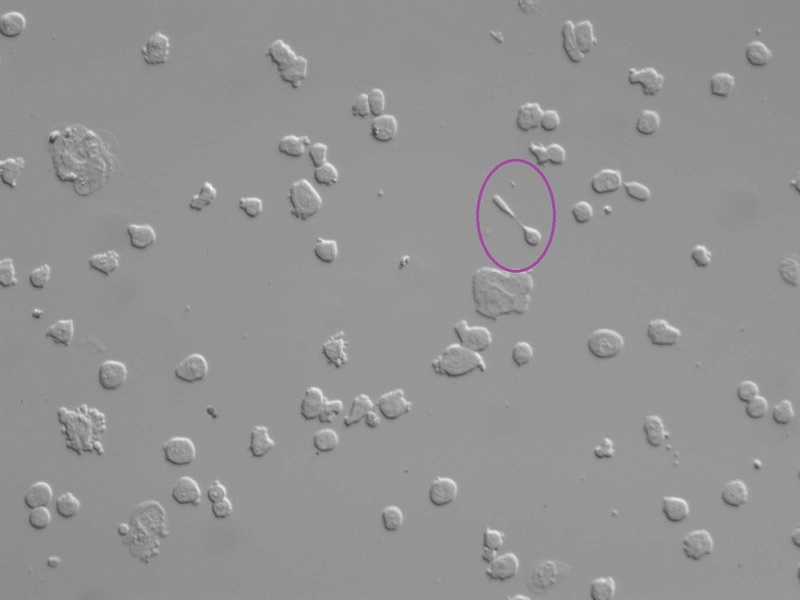 Question: Is there an experience cell culturist in your lab who can look at your cells and give an opinion???? Hope this calms you down. Thanks for the reply. Yeah it doesn't look like contamination to me either (I've been doing cell culture for quite a few years).. but I'm starting to be concerned! 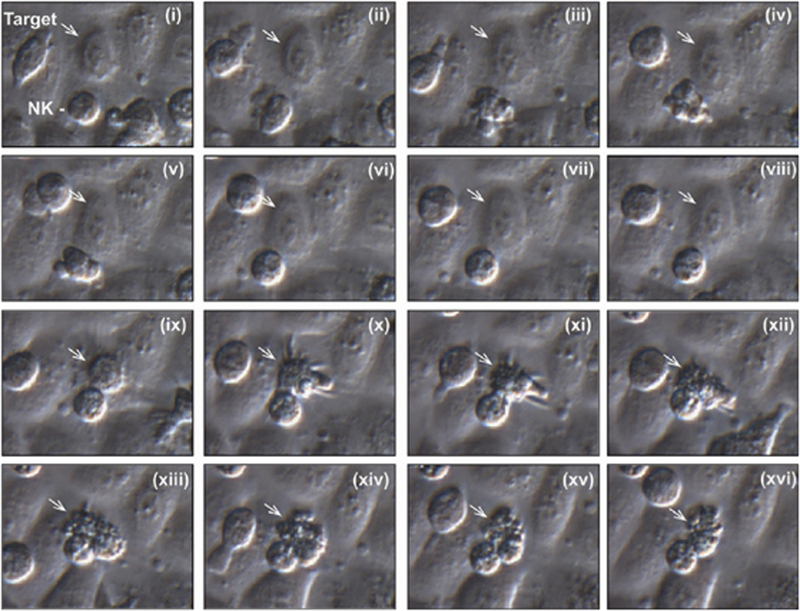 My cells do naturally bleb particularly when they are cytotoxic and stimulated with certain cytokines, but they seem to be far more exaggerated in my culture than pictures i've found in references.. I have mycoplasma tested them with Hoechst, but not with the agar method, I'm pretty sure they are clean, but will agar check them just to be sure.. I thought the Hoechst might be useful to detect anything that was potentially infectious i.e. Bacteria, fungus, spores etc As I think the DNA should stain up with Hoechst - so potentially ruling out anything else that could be at play?? I have changed to a new bottle of FCS, but it is the same batch as my old FCS.. so it shouldn't have disrupted them too much. I am going to show the cells to a really experienced cell culturist in the department.. But thought i'd ask a wider source hence the forum, as I know she hasn't had much experience with suspension cells.. I'm starting to think they may just be abnormal morphology.. only about 1% of my cells are doing this weird projectiony thing.. But obviously before carrying out experiments I want to ensure it's not something else going on.. I'd rather rule out everything than do experiments which are worthless.. Thanks for a bit of piece of mind!! Was starting to go crazy!! It's me again!! Well it looks like it could be abnormal morphology.. just a quirk of the cell line..maybe!! 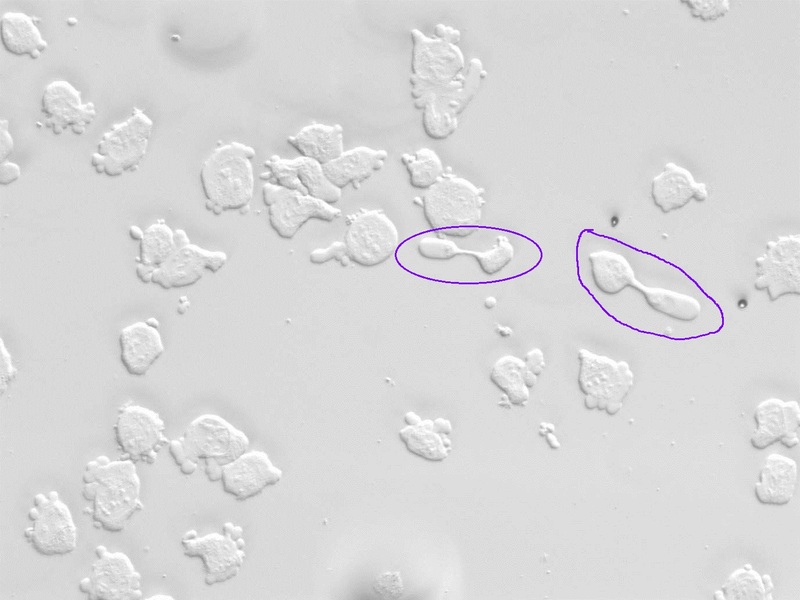 I just found this picture from an article published last year and it looks like the cells in pictures Xi AND in particular the weird one in Xiv look quite similar to mine.. What do you think?? Cheers and thanks again for the help! yeah I did think that, but they're just a bit too far apart to be dividing, normally these guys divide like lymphocytes, so fairly close together.. I also watched them for a bit to see if they divide and they didn't.. Also Hoechst stain failed to show up in the projection, but did stain the DNA in the nucleus of the rounder cell part.. Not sure to be honest.. Am starting to think as they are a cancer cell line, just some of them are a bit abnormal.. also the picture I found seems to suggest that there is some degree of abnormality.. Am still going to test for mycoplasma and just exam viability for a bit and see how they behave!